Get EGG-cited! 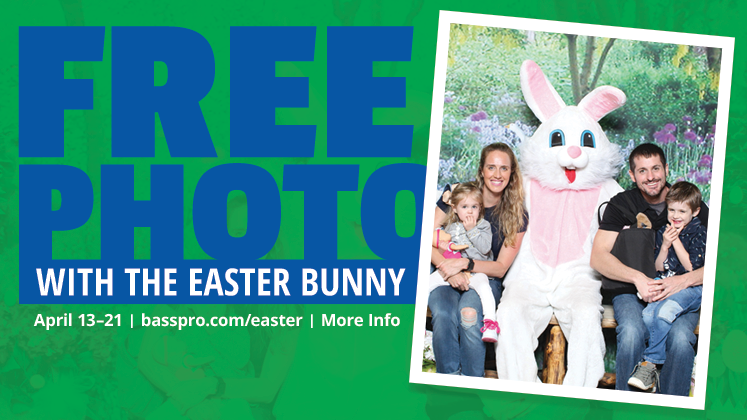 The Easter Bunny is taking the bunny trail all the way to Bass Pro! We will have crafts for children and the Easter Bunny will be taking pictures with families! So grab your peeps and hop on down to Bass Pro to join us in the festivities! 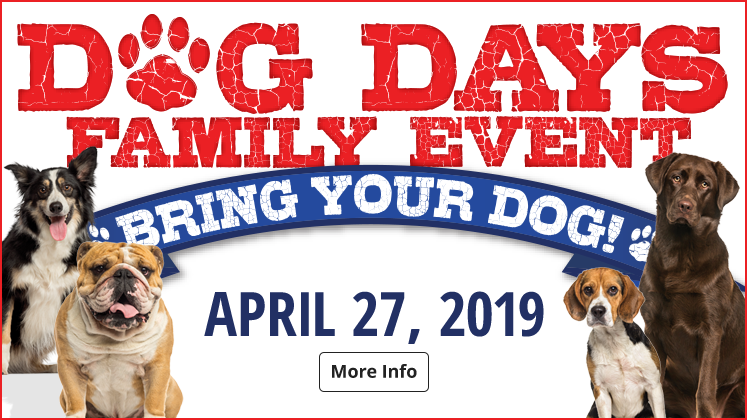 Join Bass Pro as we celebrate man's best friend with our domestic dog days! We will have various seminars pertaining to training your dog, doggy health, and things to do with your dog outdoors, after the seminars you can pose with your pooch for our free photo download featuring our outdoor park backdrop. When you enter our store, the hustle and bustle of the Silicon Valley will be left behind and you will immediately feel the heartwarming sensation of being in a cabin with a large stone fireplace. Take a deep breath and look all around you- up, down, left, right. There is detail everywhere you look. If you look up, you’ll see hand-painted murals on all of our walls that reflect the unique traits of the golden hills of the Bay Area along with the beauty of Yosemite National Park. The grass in all of our scenery is native to the Bay Area and make sure you take a look at all of the different animals that are roaming through the grass. But don’t forget to look down! There are animal tracks imprinted on the floor. Can you match the animal to the correct tracks? Coming here is more than just shopping, it’s an adventure! We have everything you’ll need for your next outdoor adventure, and more! Our Gifts department has all of your “around the house” necessities, such as furniture, snacks, cooking sauces, cook books along with toys and games for the kids. Our Camping department has everything you didn’t realize you needed for your camping trip until you visit this section of our store! We have supplies for camping, hiking, backpacking and even BBQs, smokers and fire pits for your backyard! Our apparel department carries brands such as Columbia, The North Face, Bob Timberlake, Under Armour and more! We have apparel and footwear for men, women and kids. Don’t forget to check out our Tracker department where we have boats, ATVs, fish finders, motors for your boat and more! 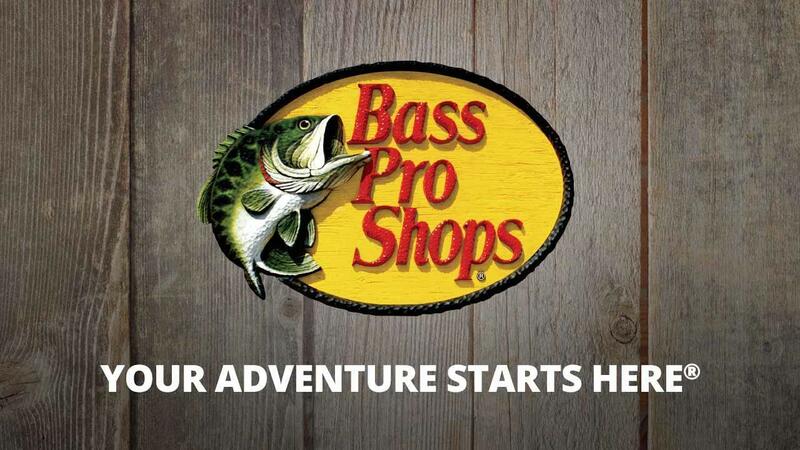 Stay tuned for hunting and fishing seminars, sales and events right here on our store website. Our 14,000 gallon aquarium with multiple waterfalls is always a must see at our store! Our aquarium is home to Sturgeon, Large Mouth Bass, Striped Bass, Catfish, Carp and Small Mouth Bass. Can you tell them apart? Come join us for our Fish Feedings every Saturday at noon! This is a great way to learn more about our fish and some of their favorite food! Are you looking for a place to hold a birthday party/corporate event or for a fun and casual dining experience? Uncle Buck’s Fishbowl and Grill it is! Our underwater themed restaurant and 12 bowling lanes makes it fun for all ages! We also have private dining rooms to host parties and meetings. Make sure to call ahead of time to reserve one of our private dining rooms for your next party! We have several store events throughout the year that are FREE! We have educational seminars and workshops along with family events (catch and release fishing ponds, Easter bunny pictures, Family Summer Camp, Halloween, Santa’s Wonderland and more!) 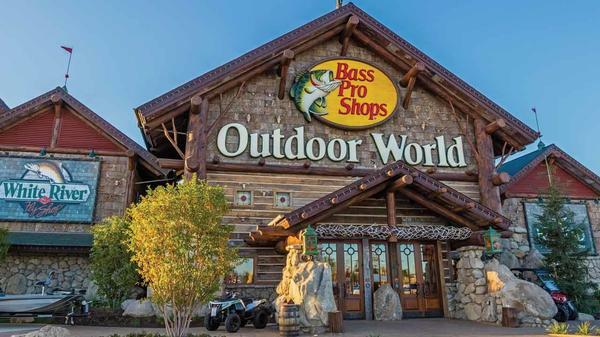 Stay tuned on our website for upcoming events and follow us on Facebook at Bass Pro Shops San Jose, CA. If you have any questions about any department and/or our merchandise, we have expert staff that specialize in each department who are ready to help! Come by our store or give us a call at (669)-234-5700. - Lifelong hunter with extensive experience hunting California, Nevada, Texas, Arizona and Missouri. - Guide and Pro Staff for Weaubleau Creek Outfitters of Missouri. - 25 accomplished years in the Fire Service. - Currently resides in Central California with his wife and three daughters. •	Bass fishing Professional Angler and a Northern California Licensed Fishing Guide. 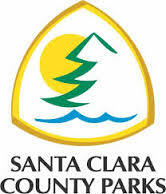 •	One of the founders of the Santa Clara Bass Busters fishing club established in 1969. •	Citgo Bass Masters Tour amateur division taking third place April 2003. As seen on ESPN2 Sports. Helping our American Heroes by taking them on hunting and fishing trips. 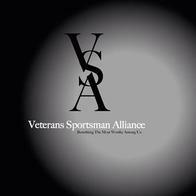 It's a great opportunity for Veterans to not only enjoy the outdoors, but also be a part of a great community. Great destination for families to enjoy the outdoors.